The traditional view of shark intelligence is that they have none to speak of. It was taken for granted that a given stimulus would generate in any shark a specific, un-learned response. This response would be performed the same way, time-after-time, independent of context or probable survival value. In short: sharks were deemed to be little more than mindless automatons. It had long been assumed that, like other sharks, the Great White operates largely on the basis of instinct. Instinct may be defined as a highly stereotyped (performed the same way each time) behavior, usually directed toward objects in the environment, that is more complex than simple reflexes. Certain instinctive behaviors may be modified through learning, but most tend toward a narrow, predictable response. Examples of instinctive behaviors in the White Shark include rolling the eye tailward when the snout touches an object and body language elicited in social contexts. 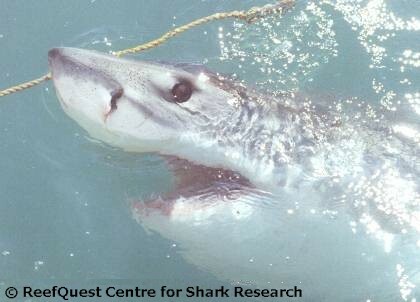 Observations of baited White Sharks reveal that most individuals quickly learn that the bait, nearby boat and shark cages do not represent a threat to its eyes. In response, the eye-rolling behavior is greatly reduced and may discontinue altogether for as long as an individual shark is feeding in that now-familiar situation. This is an example of habituation. If, however, a human boldly — and ill-advisedly — reaches out to pat an inured White Shark on the head, the eye rolling behavior is likely to re-appear. Similarly, White Shark display behavior (body language) tends to be highly stereotyped. Yet this response, like the eye rolling behavior, is often muted with frequent exposure to the same context, as in areas where organized shark feedings are regularly choreographed for the benefit of tourists. It seems very likely that, when such intimate behaviors become better documented and understood, White Shark precopulatory rituals are also highly stereotyped. As opportunistic predators that must perennially be willing to exploit new food resources, sharks often display overt curiosity toward novel objects in their environment. Porbeagles (Lamna nasus) off the Cornish coast seem to be utterly fascinated by the balloons that sport anglers use to hold their baited hooks a set distance below the surface. A fascinating 1996 paper by Wesley Strong demonstrated that, given a choice between a floating seal-shaped decoy and a floating plyboard square of comparable surface area, 9 to 31% of White Sharks tested off South Australia preferentially approached and visually inspected the square. There are numerous reports from South Australia and the Farallon Islands, California, of White Sharks slowly gliding past and even languidly circling professional abalone divers before peacefully swimming away. At no time did these sharks show any sign of aggression toward the divers; they merely gave the distinct impression of swimming by for a closer look at the unfamiliar phenomenon of a clumsy, bubbling biped. In a provocative 1996 paper, shark researchers Ralph Collier, Mark Marks, and Ronald Warner examined cases of White Shark attacks on inanimate objects along the Pacific coast of North America. Collier and his colleagues found that a wide variety of floating objects had been bumped and/or nipped by White Sharks and they noted that it seemed to make little difference what color, shape, size, or kind of movement (minimal, constant, or erratic) the objects had when struck. The only factor that seemed consistent among all cases was that the object was at the surface when struck, although this could represent observer bias — as surface-bound creatures, we have virtually no idea how often Great Whites or other sharks strike inanimate objects underwater. What is intriguing about these cases, however, is the fact that relatively little damage was inflicted against the objects struck by White Sharks — suggesting that the animals were examining rather than attempting to eat them. This, and other behavioral evidence, strongly suggests that the Great White experiences curiosity. Sharks were long presumed to be too primitive and stupid to be capable of learning. In a pivotal 1963 paper, ichthyologist Eugenie Clark demonstrated that captive Lemon (Negaprion brevirostris) and Nurse (Ginglymostoma cirratum) Sharks could learn and remember as well as some mammals. In as few as 10 trials, some of the Lemon Sharks learned to press their snouts against a submerged plyboard target and wait for an underwater bell before returning to a specific part of the pool to receive a 'reward' of food. This association of an action and a sound with the imminent arrival of food is an example of conditioning. By the end of the first week, all the sharks of both species learned to perform this task. When the water cooled in winter, the sharks lost interest in feeding and the experiment was temporarily suspended. But when the waters warmed in the spring — some 10 weeks later — the sharks were once again presented with the underwater target. To everyone's astonishment, the sharks performed perfectly, as though they had not lost a single day's practice. Of course, pressing targets and ringing bells have little or no relation to feeding in the lives of wild sharks. Zoologists Robert Jackson and R. Stimson Wilcox have demonstrated that — despite their tiny, simple brains — jumping spiders of the genus Portia can learn to hunt other spiders using trial and error. Surely sharks — with their much larger and more complex brains — can also draw on experience to learn how to become more effective predators. One of the best-documented examples of this comes from the shallow waters off Hawaii. Each year, from June to August, the Line Islands are invaded by some 14 million seabirds of 15 species that migrate to these isolated sand cays to nest and rear their young. Among the squawking, flapping, guano-excreting hoard are hundreds of thousands of pairs of the Black-Footed Albatross (Diomedea nigripes). Black-Footed Albatross chicks grow rapidly on a diet of regurgitated fish and, by about mid-June, most are preparing to leave the nest. Each morning, when the wind rises off the surrounding sea, these fledglings test their developing flying muscles. Some flap impotently, others rise vertically a few feet off the ground for a few seconds at a time, and still others glide a short distance to set down in the shallow waters surrounding the place of their birth. Just offshore, in water only a few feet deep, aggregations of Tiger Sharks (Galeocerdo cuvier) wait for them. Tiger Sharks are only seen here for the two weeks or so that the albatrosses fledge. Initially, the Tiger Sharks have little success capturing the hapless albatross fledglings that plunk into the shallows — the light-weight chicks are pushed away from the surface-rushing sharks like corks bobbing on a bow-wave. The sharks are out of practice, as many of them have not tried to catch albatross chicks since the same season a year before. After a few days' of trial and error, however, the Tiger Sharks learn — or re-learn — the tricks essential to successful capture of the albatross chicks. The sharks learn that to ensure catching on of the bobbing birds, they must rise high out of the water. The sharks also learn that, if they miss a given chick, they are most likely to re-acquire it a short distance upwind — for that is where the panicked but weak bird will probably land. As we shall see in the next chapter, the White Shark also learns how to maximize its chances for predatory success. Sharks earn their predatory living gliding through a complex, four-dimensional and dynamically changing liquid universe. Like its less infamous kin, the White Shark navigates from place to place in a visually concealing realm punctuated by acoustic, chemical, vibratory, and electrical signposts we do not yet know how to read. Until relatively recently, the comings and goings of the Great White and most other sharks were mysterious and completely unpredictable. But, thanks to the tireless efforts of hundreds of marine researchers, our near-total ignorance of shark movement patterns is slowly being replaced by the beginnings of an understanding. Accumulated returns from shark tagging programs conducted since the mid-20th Century off the shores of many maritime countries have begun revealing basic patterns of seasonal migration in many species. More recently, sonic telemetry (the underwater equivalent of radio tagging) has elucidated the day-to-day movements of numerous species of sharks. These studies have revealed surprisingly well-defined and predictable patterns of movement for some shark species at certain locations. For example, off northern California and South Australia, sonic telemetry studies have shown that White Sharks move about in fairly regular and predictable patterns. Each autumn, from about August to November, White Sharks appear off the craggy and isolated Farallon Islands, California, apparently to prey upon the seals and sea lions that breed there. White Sharks in Spencer Gulf, South Australia patrol around and among the rocky islands in patterns that suggest the sharks form a resident population, each member with a discrete home range. At Rangiroa Atoll, French Polynesia, shark behaviorists Donald Nelson and Richard Johnson have found that sonically tagged Grey Reef Sharks (Carcharhinus amblyrhynchos) are astonishingly regular in their day-to-day movements. Johnson and Nelson found that these sharks' movements are so regular that they could predict, down to a matter of minutes, when and in what direction an individual shark would pass by a given point along its established route. How do sharks manage to keep such well maintained schedules of time and space? The seasonal and daily movement patterns of the Port Jackson Shark (Heterodontus portusjacksoni) have for decades been studied by Australian zoologist A. Ken O'Gower. O'Gower found that these chubby, bottom-dwelling sharks repeatedly visit specific resting sites on rocky reefs at South Bondi, New South Wales, and — when disturbed — move directly from one site to another. In addition, he found that Port Jackson Sharks also use specific resting sites in Sydney Harbor and — when transferred by boat to different localities within the Harbor, up to 1.9 miles (3 kilometres) away — returned to their original resting sites. This is no mean feat, as Port Jackson Sharks average only about 2 feet (60 centimetres) in length. Working with his long-time colleague, fellow Aussie zoologist Allan Nash, O'Gower had previously used tagging to demonstrate that Port Jackson Sharks migrate from as far south as Tasmania to Sydney Harbour to lay their auger-shaped eggs at specific, traditional sites. Based on these studies of precision navigation in the Port Jackson Shark, O'Gower proposed in a bold 1995 paper that this species must have a highly developed spatial memory. Many species of sharks utilize specific bays or other sheltered areas for egg-laying or pupping and still others for mating. It is likely that the White Shark, too, seeks out specific locations for giving birth and mating, but these remain to be discovered. As a prelude to mating, many shark species perform complex — and sometimes violent — precopulatory rituals, often resulting in females of the species receiving nasty-looking but not life-threatening scars on their nape, back, flanks or fins. These sexual rituals are absolutely vital to securing the mutual understanding and cooperation that intromission demands. As well-armed creatures capable of seriously injuring one another, sharks have evolved many other complex and subtle social rituals. We are only just beginning to understand how to read shark body language. Many of the most overt signals occur in competitive contexts, such as during feeding on highly localized bait or in approach-withdrawal conflict situations. In the course of my own field research, I have discovered that shark threat displays are most often elicited when a shark's idiosphere (personal space) is persistently violated. I have also discovered that these so-called 'agonistic displays' vary from species to species, yet some common features of these displays are becoming clear. Observations of social interactions among White Sharks indicates that this species, too, has a complex and dynamic social life that is — for the most part — remarkably peaceful. White Shark social hierarchies are apparently relatively stable and peaceable: each member of a given population seems to understand its rank relative to the others, recalling which individuals are dominant over itself and which are submissive. When disputes over possession of a prey item or invasion of idiosphere occur, they are usually resolved non-violently through agonistic displays. All of the foregoing strongly suggests that the mental universe of the White Shark is quite complex. Given its remarkable sensory talents, ability to examine, learn and remember, the strategic demands of predation and reproduction, the dynamic complexity of its social structure, and basic communicative ability, it is easy to appreciate why the Great White has evolved such a large, complex brain. What the White Shark does guided by that large, complex brain is a topic of much interest and debate. Much of that interest and debate has centered around the question of why the Great White sometimes bites, kills, or eats people (there's no interest like self-interest). We feel confident that if only we understood why White Sharks attack people, we might be better able to protect ourselves. But to understand why the Great White occasionally attacks humans, we need to explore how this creature thinks — especially how it perceives, learns about, and reacts to human beings in its environment. Understanding this holds important implications for humans who find themselves in the company of this very powerful and well-armed shark. Is the White Shark Intelligent?